Help your staff, contractors and volunteers stay up to date with their clearances. Trackforms.com provides you with accurate and up-to-date information that you can trust. Access your staffs clearance information from anywhere using a web browser. Our system not only includes comprehensive clearance records of the user you're looking for, but also provides you with the date the clearance form was registered, when it expires, how much time is left and progress on any notifications that have been sent. 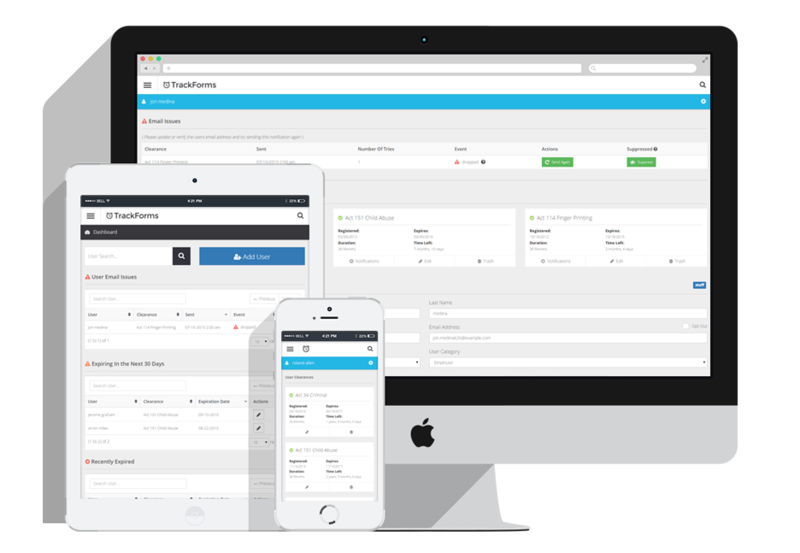 Trackforms is designed to work on any of your devices including mobile phones, tablets and desktops. We've made it easy for you to view your users information and manage their data. In today’s world, information is key. To allow for this, we've designed our system to keep you and your staff up-to-date through automated expiration email notifications. Clearance forms are a part of work life. Whether it's a federal criminal clearance form or a state's child abuse history clearance, Trackforms can enable or create what you need. The Trackforms dashboard keeps you informed and up to date with listings of recently expired forms, forms that are nearing their expiration date and any notification issues that may arise due to incorrect email addresses and bounces.